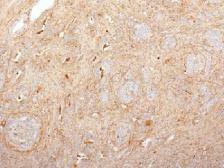 Specificity/Sensitivity: Recognises fibronectin in human and mouse tissues, specifically connective tissues and vessels. No reactivity with the soluble dimeric form of fibronectin (plasma fibronectin), but highly reactive with matrix fibronectin. Specificity/Sensitivity: Fibronectin is an extracellular matrix glycoprotein present on most cell surfaces, in extracellular fluids and in plasma. 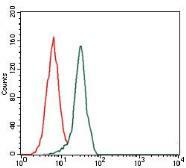 A high molecular weight heterodimeric protein, it was originally discovered as a protein missing from the surfaces of virus-transformed cells, and it has been shown to be involved in various functions including cell adhesion, cell motility and wound healing. Alternative splicing and glycosylation give rise to several different forms of Fibronectin, some of which exhibit restricted tissue distribution or association with malignancies. It has been shown that Myofibroblasts phenotype formation correlates with the occurrence of glycosylated Fibronectin and Fibronectin splice variants in Dupuytrenā€™s disease. 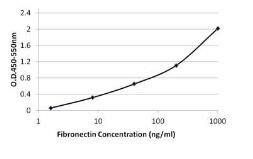 Specificity/Sensitivity: Fibronectin is a soluble dimeric glycoprotein of 440kDa, which is present in cells, extracellular matrix, and blood. 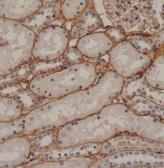 This MAb reacts with the cellular as well as plasma form of fibronectin. 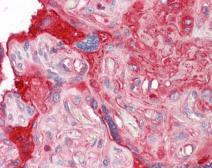 Reportedly, after iv administration, this MAb localizes to tumor vessels where it binds to the underlying basement. 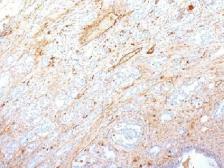 Epitope recognized by this antibody is not accessible in normal tissues to the circulating MAb indicating that it can be used to specifically target tumor vessels in vivo. TV-1 is reportedly useful for delivering vasoactive agents to tumors to induce increased vascular permeability or blood flow prior to treatment with chemotherapeutic drugs or MAbs.